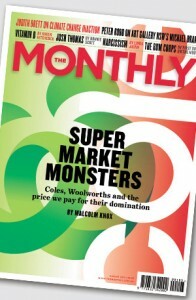 There is a very hard-hitting article in the August 2014 issue of The Monthly on how the two large supermarkets have been allowed to rip anyone and everyone off. Even more depressing is that it points to how we, as consumers, are continuing to allow this to happen. The major point raised by the article is how this dominance of the two of these supermarkets has reduced the food security in this country. Collectively through all sorts of dubious practices, the two corporations who own the two supermarkets have driven out many of our distributors, farmers and producers and in many cases have replaced them with imported goods. In the last decade Australia has fast become very insecure in having access to its own home grown food supply. Locally, in Dickson, we are about to have a second major supermarket, Coles, built alongside the already very large Woolworths. The idea was that this is supposed to introduce more competition and provide ‘more choice‘. I chuckle at this stupid statement – more choice indeed! The reality will be that they will both now conspire to provide more of the same while killing off the local small shop owners. The Monthly is highly recommend reading. It is a good read. Although I do wonder about their writing, or lack of it, when it comes to the visual arts and photography. Where have all the visual arts writers gone? There’s so much happening yet we see so little of it reported in The Monthly or The Saturday Paper. Footnote: Having insecure food supplies as a result of greedy profit making has happened previously. There’s a book that outlines the history of Empires of Food and how it can lead to the collapse of civilisations. Click here.